Happiness is something we all pursue, especially over the Christmas season. The modern fount of all wisdom, Wikipedia, defines happiness as “a mental or emotional state of well-being defined by positive or pleasant emotions ranging from contentment to intense joy”. 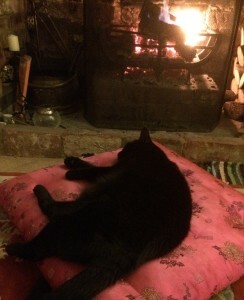 If I was looking for a picture to illustrate this then Jessica the cat lying before the fire might fit well. However I would like to suggest that this common cultural definition of happiness is a dead end, a recipe for unhappiness. It splits human experience into happy/unhappy, suggesting that emotions that don’t make your positive/pleasant list are unwanted or, more insidiously, should be rejected and repressed. We are bound to experience fear, sadness and anger. These are not generally viewed as positive and happy emotions so feeling them can be unwelcome, even shameful. Huge value gets placed in our culture on being happy and rational. The impact of this that I see every day as a counsellor is anxiety, sadness, and depression caused in part by not being ‘happy’. We become anxious about being anxious, depressed about being sad and think we are defective if we can’t just get on with things and smile when seething with anger inside. Unhappy emotions are not welcome. Being excluded these emotions will often make more trouble for us, rather like the barking dog you shut in a small room in the hope you won’t be able to hear him any more. Of course, that dog will just keep barking until you let him out and pay him some attention. I believe happiness has a wider definition, closer to the ‘contentment’ mentioned in Wikipedia than to joy. If we are content to be sad, angry or even anxious and depressed, then we can include those emotions in our definition of happiness. Rather than what you feel, I believe it is your attitude towards yourself and your feelings that makes the difference. Life is bittersweet and our emotional range reflects that aspect of our humanity. For example, when I have a disappointment my internal self-talk can easily turn into ‘get one with it, keep going, smile and be strong’, rather than allowing a time to grieve that disappointment and be sad. I try to tell myself ‘it’s ok to be sad, in fact it is an appropriate and necessary part of living’. Then I can let it go rather than keeping it hidden deep inside, where it may fester and grow malignant. It may sound as if I am arguing black is white, that unhappiness is happiness. What I am arguing is that splitting emotions into good/bad makes trouble for us and that it is useful to accept the whole range of our experience. So if you feel ‘unhappy’ during the festive season, or someone you are with feels the same way, try to accept that feeling and be with it for a while. Wishing you a contented Christmas.